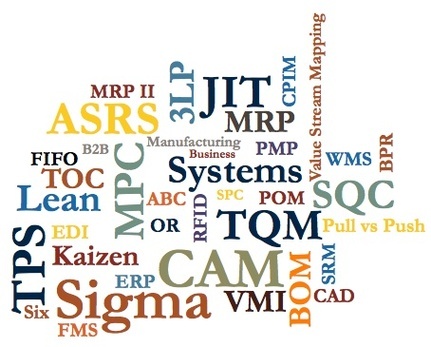 So You Are Confused By Manufacturing Acronyms. The enterprise software space has hundreds of three-letter or more acronyms—from ERP, MPS, MRP and MOM to MES ext.……—that represent technologies that help make managing business processes easier. An ERP system in their comprehensiveness should broadly covers: Accounting, Sales and Distribution, Purchasing Planning, Production Planning, Shop Floor Control, and Logistics. 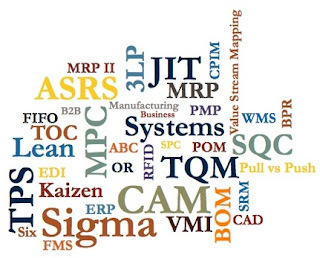 Here are ten (10) TERMS & ACRONYMS usually used by ERP sales personnel or consultants. It is SIMPLIFIED so that non-technical people won’t get lost in the alphabet soup of software and technology. 1. MRP - Material Requirement Planning. A set of technique in managing the inventory, multi-level bills of material, purchasing. All three functions are integrated to produce a time-phase plan showing timing and quantity of material requires supporting the MPS. The integration of MPS should provide time phase production plan, it will analyze the inventory, bom, and create the necessary purchase orders and work orders. It is a record representing the quantities and timing of producing deliverable goods manufacturing facilities has the capacity to make. The Shop Floor Control allows users to record time entries and shop transactions of manufacturing operations. It provides detailed production data between the releases of the manufacturing order to the completion of the production run. It is basically a online production log. A finished product or subassembly with a list of components parts or recipe which provide parent child relationships. A operation concept refers to the movements of material at the necessary place at the necessary time. The implication is that each operation is closely synchronized with the subsequent one to make that a zero inventory, stockless production. An approach encompassing all phases of a manufacturing organization, from design engineering to delivery, that attempt to eliminate defect. Its includes; process control, easy-to-see quality, compliance to spec, etc. A priority based inventory count verification process which often integrated with ABC items classification with period date control counting. A process of sorting the total inventory into three classes- A or B or C based on the dollar value volume of usage, normally over a full year. Normally the top 5 to 10 % of the total inventory will represent 90 % of the Total inventory value and thus be class A items. “A” items should be given the highest degree of attention because it represent a high proportion of the total investment in inventory. Lean is a strategy and generally is not an ERP product function or module. It means optimizing your process and keeping inventory as low as possible and reducing waste at every step. Off course the purist would insist on mimicking the kanban card systems. 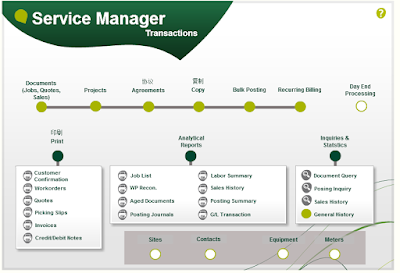 SAGE 300 - Integrated Services Management Solution. Major functional areas in Service Manager. If you are involves the Sales, Service & Spares (3S) business, Maintenance contracting or Equipment servicing business, Rental of equipment or any other service industry then your business can be one of the many to benefit from deploying the Service Manager system. If you are a large business with multiple locations in a global market place, require multi-currency and branch accounting, tax support and the ability to add unlimited employees, Sage 300 Service Manager solution can meet your requirements. Service Manager provides you with an effective means to plan, control, organize, operate, and manage the products and services that your business has to offer. From quickly and easily create and schedule new Jobs and update Job details. You will be able to Track Job progress from Estimate quote, acceptance, assignments, sites to Invoice. Advance Scheduling is effectively a powerful scheduling tool very much calendar based for the most demanding scheduling operational requirements: 3 pivot views - Outlook Calendar, Job List and Timeline. It Integrates with Google Maps for directions and route optimization. Manage all of your Employees whether a field technician, sales, or office staff as the most important resources of your business, it is vital that your employees are effectively utilized, tracked and managed. Online mobile capabilities for your field engineers and remote online staffs. Device independent, browser based - protecting your investment - Supports any current Apple, Android, or Windows phone or tablet device. In today’s complex business environment, vendors play a key role in the success of your organization. 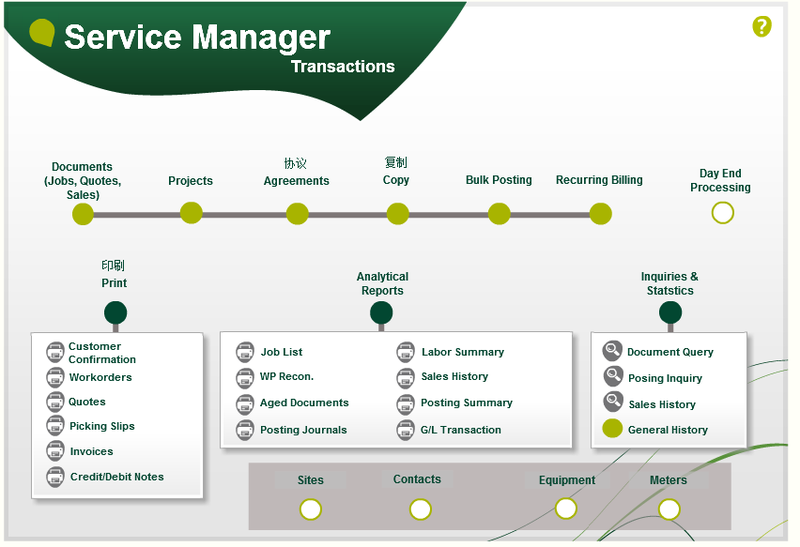 Managing your Vendors such as Subcontractors, Consultants, Suppliers, has never been easier with Sage 300. You may give access to a Subcontractor to update their Job progress and schedule on the service portal. Track bills and checks from Vendors and easily view balances and all Vendor transactions. The Service Manager Employee Web Portal allows “your” employees to access your accounting and management systems online using a web browser. Engineers/technicians, as well as general staff can log in to view their existing jobs. Those jobs can then be modified by adding labor and parts, notations, equipment and other details. Create new jobs online and assign employees to those jobs. Quotes can also be created and a quote can then be promoted to a job if approved. * The ability to control your entire business from a single point within an integrated accounting solution. * Critical analytical business information is readily available to you at all times. * Save time and money by effectively managing your labor scheduling, stock availability, job profitability, RMAs, site equipment records, and most importantly manage your relationship with your customers. * You can create Service Level Agreement s, Warranty Agreements, and Meter Agreements to monitor and support your customers. * You can use the fault analysis tools to provide a quick and easy method to diagnose symptoms and ascertain appropriate solutions each time a fault is reported or a question is asked. * Real-time updates of jobs from the field using devices such as smart telephones, tablets or notebooks. Better management, better control, information... Better profitability and service! Source: Technisoft Service Manager ®, a Sage Endorsed Solution for Service and Maintenance Industries. To learn all about Sage 300 Solutions contact CAREWARE Account Manager today by calling (03) 27143855 or by emailing sales@careware.com.my There are multiple licensing options; one is sure to be a perfect fit for your company.